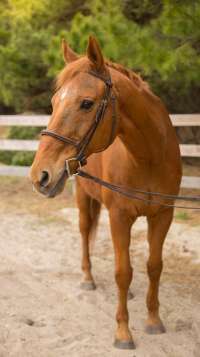 "Red Oak Apollo” or Apollo for short, is a ten year old Thoroughbred gelding whose past as a 4H horse has made him a superb mount in our lesson program. Nothing fazes Apollo, whether it is at home or in the show ring. He enjoys jumping as well as going on trail rides. or as she's known around the barn Tica! Tica is a 13 year old Selle Francais mare. Her dainty stature makes her great for our smaller riders. Don't let her size fool you thoughshe is also an educated and athletic horse for our more advanced riders! 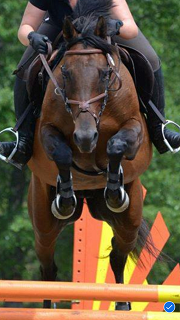 Tica has a solid dressage foundation, experience in the jumper arena, and in the hunt field! 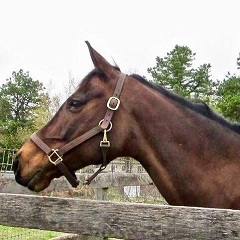 “Kinkaid” is the most seasoned horse of the group, as he is a twenty three year old Thoroughbred. His past careers include steeple chasing, working cross country, and learning low level dressage. Students can feel confident and well cared for on this gentle giant. 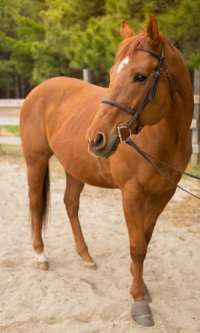 “Sweet Something’s” or Willow is a ten year old Thoroughbred mare. Willow is a nice mount for the slightly more advanced students looking to ride a horse with talent and scope. Willow is a fun ride and loves to jump!